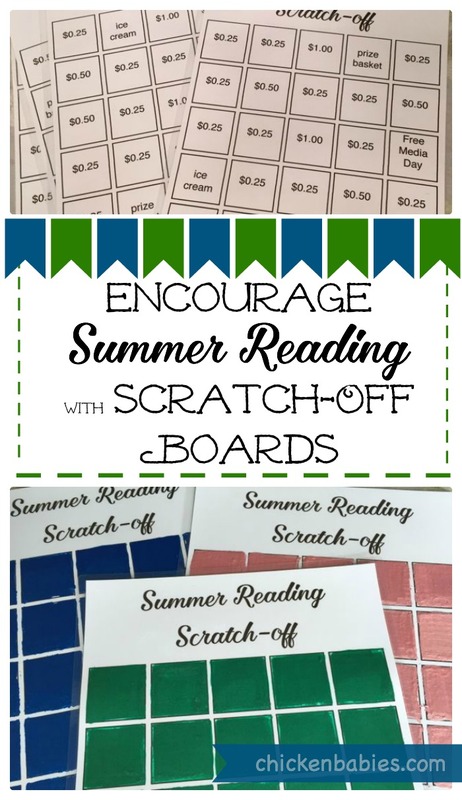 Kids love this fun scratch-off game that encourages summer reading! Every summer I like to do some kind of summer reading incentive at home. We also participate in the library's program, and maybe a bookstore program or two, but the kids always love the one we do at home. This year I made myself laugh by coming up with a devious plan to ruin their fun. I was going to offer them a dime for every book they read OR they could trade it in for a chance at the "risk board", kind of like that "Let's Make a Deal" game show. The risk board would have some really cool fun stuff on it, but also some chores or punishments. I thought it was a hilarious plan. My 12 year old thought it sounded awful. 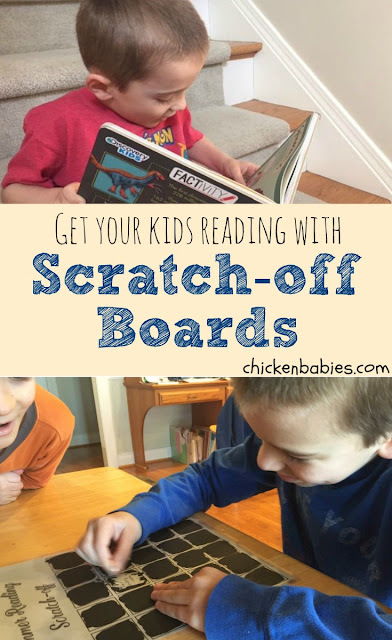 I decided against it in the long run but instead came up with an idea for a scratch-off board which so far they have loved. Every time they read a book (or two, depending on how long/hard the books are) they write the title on our summer reading book lists and put the book away. That's an important step or we end up with books all over the house. 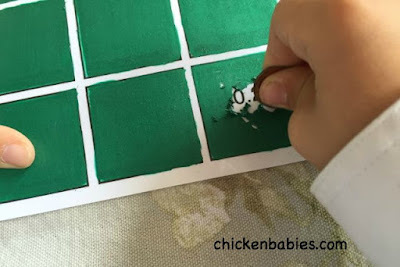 Then they scratch off a square on our scratch-off boards and get whatever prize they reveal. The prizes I included were 25 cents, 50 cents, a dollar, ice cream (I keep drumsticks ice cream cones in our freezer for this prize), a prize from our prize basket (which contains candy, gum, bubbles, and other small things), or a free media day (where they can play on electronic devices or watch shows as long as they want once their morning work is done). 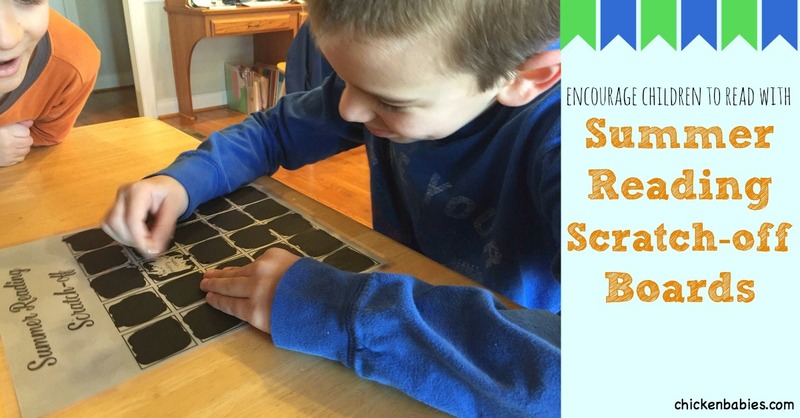 Print out your Scratch-Off Boards onto card stock. Now you need to cover the boxes with something clear and slippery. I first tried just covering the bottom part with Con-tact paper but found it wasn't great. I ended up running the whole page through my laminator (which I love) and it worked great. Plus I can reuse the boards! I've also read that some people just cover the spots with packing tape and that works. Next mix up your scratch-off paint. You use 2 parts paint and one part dishwashing soap. I did not measure. I just put two dabs of paint on a paper plate and then guestimated a dab of soap that was half that size. It worked. Don't mix them together too vigorously or you will get lots of bubbles. Then, using your foam brush, paint over your boxes and let them dry. Reapply as many coats as you need in order to hide the prize. If I had thought it through, I would have printed out the prize in lighter color ink instead of black so they were easier to cover up. 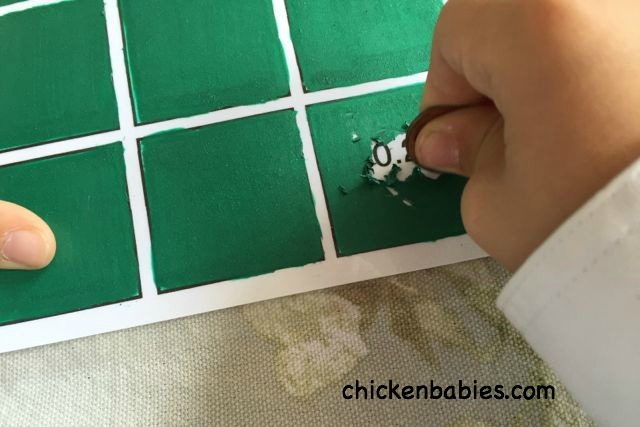 If you handwrite them in with a pencil that will also be easier to cover. It took 3 coats of the blue and green paints to cover the prize, and about 7 of the pink paint. Seriously. It was painful. Use dark colored paint. I had taken a penny and scratched around the boxes to make them look nice and neat since I was taking pictures for the blog, but really don't worry too much about staying perfectly in the lines. Kids won't care. I hope you enjoyed this idea! I have lots of other summer reading incentive ideas on the blog you might like looking at. And I'd love for you to join my newsletter or follow me on Pinterest. Thanks for stopping by! Visit Erin (Chicken Babies)'s profile on Pinterest. 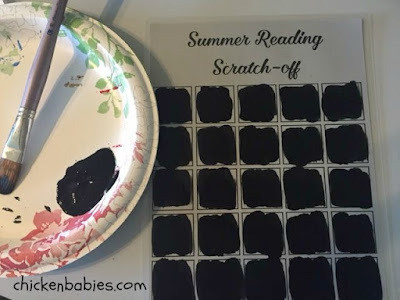 Such a fun idea--I may have to use this some time. If this is what it takes to get kids reading then bring it on. Children read far too little these days which accounts for the poor language skills of so many of our young kids these days. Yes, it is hard to compete with all the other entertainment choices they have now. 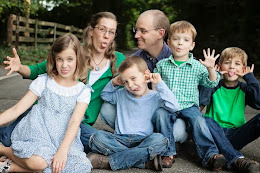 I also encourage my kids to read by modeling good reading behavior. :) They know mommy loves a good book! This is a fun one. I'm deciding right now what I want to do for our summer reading. The only problem is these scratch boards wouldn't last for the whole summer. I have them earn prizes by time, not by the book, since their books are such varying levels of length. I usually have them keep track in 30 minute increments.